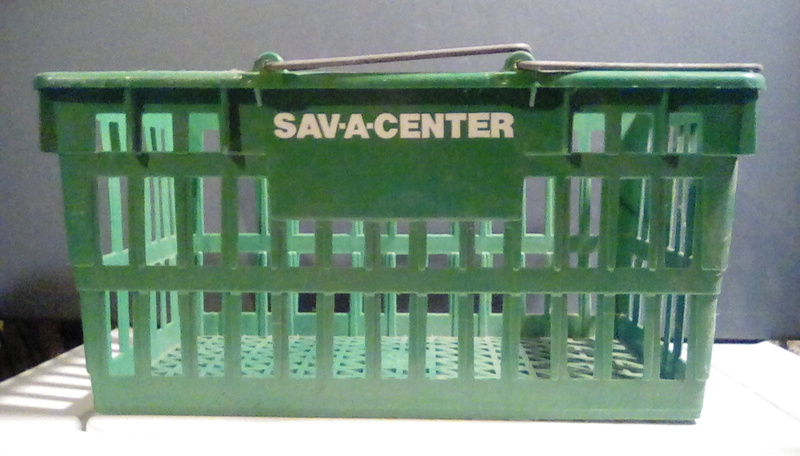 Continuing the theme of shopping baskets from last week, here's a look at a shopping basket from Sav-A-Center, sent in to The Market Report from contributor V West. This basket presumably originated from a New Jersey-area A&P Sav-A-Center, although it's strange that it doesn't include the A&P logo. There were other Sav-A-Center divisions, although it's unlikely that a Sav-A-Center basket would come from farther away. Can anyone confirm this? Depends on where your contributor is from! A&P Sav-A-Centers mainly used regular A&P (or selected banner) baskets. The Sav-A-Centers in metropolitan New Orleans is most likely where this came from. Thanks! I don't know where the contributor is from, but supermarket stuff also sure has a way of growing legs and moving around the country.